Flossing should be a part of everyone’s routine. There are many reasons you should floss along with brushing your teeth and rinsing with mouthwash every day. For starters, floss can reach food and other harmful things in between your teeth that your toothbrush sometimes misses. If that didn’t convince you to floss more, the benefits discussed in the article below will. Flossing your teeth every night can be a hard habit to develop, but it’s one that is worth the effort. It provides a number of benefits — from simply having cleaner-feeling teeth to preventing cavities to even avoiding tooth loss. Flossing reaches the places a toothbrush can’t, and it removes from between your teeth the food particles and bacteria that get trapped before they develop into plaque and tartar. The American Dental Association recommends flossing your teeth at least once a day. Bad breath can be a common and embarrassing problem to have, but regular flossing can significantly improve it. Because a toothbrush can’t remove all food trapped between your teeth, particles of it can sit in your mouth and rot, giving off foul odors in the process. As the particles break down, they release sulfurous compounds, which create a rotten egg smell. The rotten food also releases isovaleric acid, which can smell like sweat; putrescine, which gives off a smell of rotten meat; skatole, which can smell like human feces; and cadaverine, which has a smell likened to decomposing bodies. By flossing every day, you can make sure these smelly food particles are out of your mouth and in the trash. No one likes having a dentist’s drill in their mouth, and one of the easiest ways to avoid that situation is nightly flossing. Cavities are decayed areas of teeth that have created tiny holes in the enamel and, if left untreated, can develop into deep, painful pits. Cavities occur when all the bacteria, food particles, acids and saliva in your mouth come together to create plaque. The acids in plaque eat away at your teeth and can cause symptoms such as toothaches, hot or cold sensitivity, pain when biting down and visible holes. By not flossing, the plaque between your teeth can form cavities in hard-to-notice places, which can progress to the point where the hole reaches the pulp — the center of the tooth containing nerves — and causes extreme pain. Gingivitis is the first step down the road to periodontal disease, which eats away at the soft tissue and bone in your mouth and can cause tooth loss. Gingivitis is due to a buildup of plaque along the gum line, and it can cause inflammation, soft or tender gums, bad breath and gums that bleed more easily. The more plaque you have and the longer it stays trapped between your teeth, the higher the likelihood that it becomes tartar, which can only be removed by a dentist. It also becomes more likely that you will develop periodontal disease. By flossing daily, you can help lessen the risk of developing gingivitis. Left untreated, gingivitis may lead to periodontitis — a serious gum infection that can cause breakdown of gum tissue and teeth. Although the exact link is not fully understood, research suggests that periodontitis may be linked to obesity, cardiovascular disease, atherosclerosis, high blood sugar and high blood pressure. 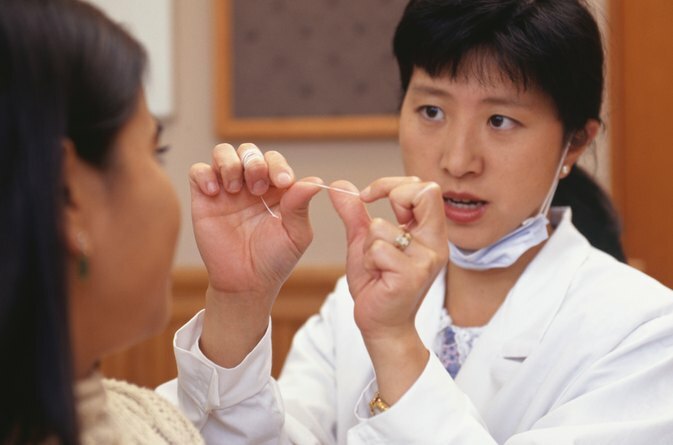 Flossing reduces the risk of gingivitis, and may in turn reduce risk of these more serious medical conditions.